High quality model of wood dome diaphragm plate mount . Earbuds which concentrated the sound technology of its own . Acoustic technology and a unique power to trees hid the fusion . Play faithfully massive enrich the midrange and pure heavy low- frequency range. Wood dome unit to faithfully reproduce the original sound It is equipped with a Φ10mm wood dome unit which adopted the diaphragm of the tree of conical shape to pursue sound more beautiful sound , was born on top of the sound quality verification . Wood dome unit suppresses the resonance and high frequency distortion of harmonic range of hand and play to enrich the massive heavy pure midrange and low frequencies . The new JVC HA-NC250 combines outstanding sound quality with advanced noise-canceling and isolation technologies to provide a superior listening experience. The HA-NC250’s noise cancellation circuitry includes feedback technology that constantly monitors the noise cancellation process. As a result, the headphones eliminate up to 85 percent of extraneous background noise. To further block noise, the HA-NC250 offers two JVC innovations that help isolate the listener from outside sounds. 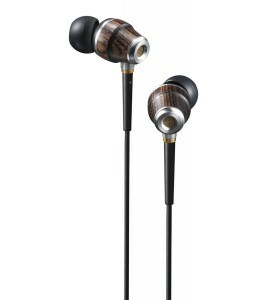 First, each earpiece employs a double housing structure for an extra sound insulation layer. Second, JVC developed a new technique for attaching the headphone’s smooth memory foam cushioned ear pads to the housing that helps isolate background noise. The smooth pads also enhance comfort. These sound isolation features, for which patents have been applied, are especially important since the HA-NC250 can be used with the active noise cancellation switched off. For the best possible sound quality, the new headphone uses a 40mm neodymium driver in each earpiece. For comfort and portability, the HA-NC250 is one of the lightest headphones in its class, weighing just 5.3 ounces. It folds flat, and when folded is slimmer than most competing models. Included with the HA-NC250 are a slim carrying case, a four-foot detachable cord, airline dual plug adapter, and ¼-inch plug adapter for use with many home audio and video components. The headphones use a single 1.5-volt AAA battery for powering the noise cancellation circuitry. Battery life is rated at about 50 hours. These high quality lightweight headphones offer three different ways of folding to suit your carrying style. 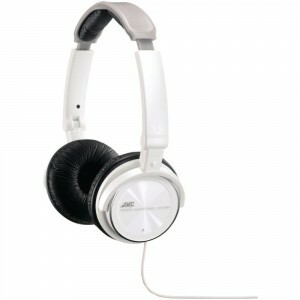 It also features comfortable ear pads and cushioned headband that promise a perfectly comfortable listening experience. The housing is twistable for one ear monitoring use. The HA-X570 features a large 40mm diaphragm and JVC’s Super Bass sound system for great sound. It has a long 3 meter (9.84 foot) cord. Pivoting ear pieces are perfect for monitoring. Get in the feel of a musical concert with the JVC HA-X570. This HA-X570 Headphone has a huge bass providing an amazing sound quality. 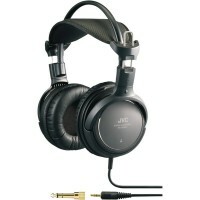 Comfortable to put on, this JVC Headphone is very light-weight and durable for long term use. 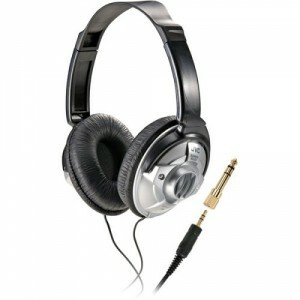 This HA-X570 Headphone comes with a big-plug adapter that you can use on a hi-fi stereo system and can also be used on laptop, iPod or a PC sound card as per your requirement.